We often carry a pen with us and lots of people carry pen as an EDC item. Then, why not carry a pen that can function as a weapon when faced with danger? If you are an outdoor enthusiast, traveler, specially survivalist then tactical pen is the must have tool. The tactical pen is not just a normal pen. The best tactical pen comes with additional features that can help us when in trouble. Tactical pens are created with a strong material, and can survive in tough circumstances. There are different types of tactical pens in the market to pick from. This depends with your needs for the pen. Some can break glass, catch DNA or even start fires!! So, how to find the best tactical pen? 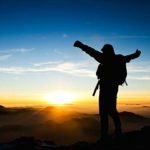 2 What should Consider when looking for the best tactical pen? What should Consider when looking for the best tactical pen? If you want a reliable and log lasting pen, tactical pens can be ideal for you. 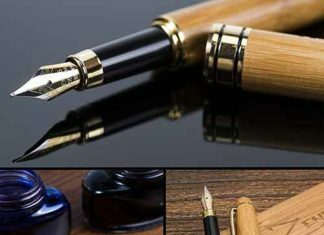 In this tactical pen review article, we’ll guide you on how to choose a great pen and as well discuss some of the most popular tactical pen in the market. For any tactical pen that you choose, it should have a strong material. Therefore, this is a very important feature that any pen should possess. The commonly used materials for tactical pens are aircraft aluminum, high impact plastic, and stainless steel. Most pens are built using aluminum but if you want a more serious and sturdy tactical pen, then a pen made from steel is the best one to use in extremely tough conditions. First things first, a pen is meant to be for writing needs. For this reason, when you pick a tactical pen just ensure that it writes well. The best ink cartridges to use for your pen are; Parker style gel ballpoint, Fischer space pen, and Parker style ballpoint which is the most utilized of the three ink cartridges. Tactical pens are created to look like ordinary pens when observed at a glance. Hence, this plays a major role of providing self defense in case anyone attacks you. Some are created to look like sharpie or even BIC and many others. In most cases, the weight of the pen you pick might have something to do with the purpose you have in mind. Some are lightweight while others are heavier. Though, most of the pens are lightweight and are made from aircraft aluminum. Heavy weight pens are most suited for harder roles like breaking glass and are very sturdy. A tactical pen should be comfortable in your hand and at the same time have a good grip. When the grip is nice, it can be a discreet defensive tool. This is because when you swing the pen in times of defense, it needs to remain firm in your hand upon impact. So, ensure the pen you choose fits well in your hand and doesn’t slip off when in action. 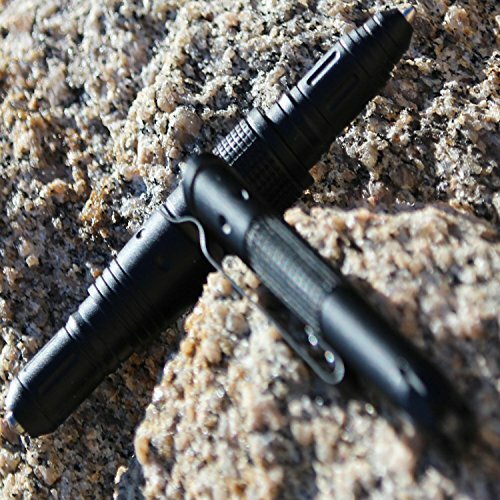 Tactical pens are created with a strong clip to hold the pen on your pocket, belt or bag. Other tactical pens come with extra features such as carabiners, paracords, and key rings. Therefore, when selecting a tactical pen for your use, ensure it has all the features you’re looking for. Below are the top five tactical pens that we think are above the rest. They are strong, reliable and effective in use. This is one of the high quality tactical pen for use in tough situations. The under control pen has several features most of which cannot be seen in other tactical pens. Some of these features include; super bright LED flashlight, glass breaker, handy belt clip, ad built-in DNA catch. The pen is constructed using a heavy duty and rugged black aluminum which is very strong and durable. Also, the pen is of a great size which can be hidden easily in your pocket or bag. Comes with additional useful features like LED light. It’s durable with the heavy aluminum. The LED light is not very effective. As sleek as this tactical pens looks, it can be used for various purposes such as drawing, sketching, selecting and note taking. The Smith and Wesson is a great company that always creates very innovative and customer oriented products. That’s why the Smith and Wesson is one of the best. It is built with aircraft aluminum and it’s very sturdy. It uses black ink and weighs 1.4 ounce which is good for an EDC item. The smith and wesson pen measures 5.7 inch and can be easily concealed from prying eyes. Only uses Fischer cartridge and not parker cartridges. 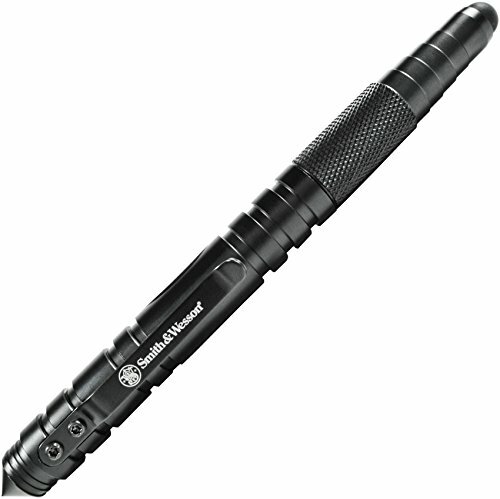 Schrade is one of the famous brands of the tactical pen in the market. They create quality and highly reliable products. 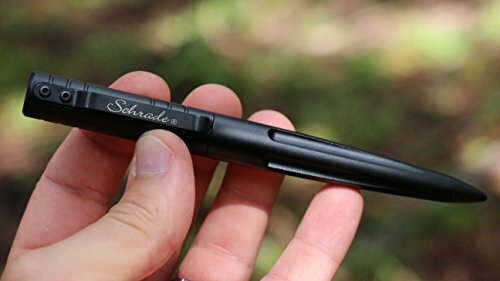 The Schrade SCPENBK pen has a sleek matte black finish that gives it a great look. The pen measures 5.7 inch and it’s ideal to move around with as an EDC item. Another great quality of this pen is that it uses Hauser parker ball point pen cartridge which is of great quality. Also it’s very strong and durable as it’s made from 6061 aircraft aluminum. It’s lightweight and easy to carry. The Columbia River knife and tool pen is built with a non-reflective black finish that gives it an outstanding appearance. The tapered body of the pen ensures that the user has a nice grip when writing or using it as a weapon. It is created from high quality materials thus its durable; the material is machined aluminum which is light but vey sturdy and long lasting. With all these amazing features that this pen carries, you can use it for high tech writing and also as a defensive tool. It’s constructed very well with a wonderful design. It’s very durable and made from strong material. Comes with lifetime limited warranty. The pen has a weak clip. The Schrade SCPEN4BK is very suitable for use when you want to break glass or in other tough situations. The pen is built with anodized aluminum body which is very strong and can withstand tough conditions. This Schrade comes with several fascinating features like a whistle and fire starter which can be of great help when need arises. As well, the Schrade pen comes with a replaceable ink cartridge. If you’re in the military or going out in the woods, this is the best tactical pen to carry with you. Has highly effective additional features like the whistle and fire starter. Has a great concealed design. The pen is a little bit heavy. Tactical pens are not only great for writing but also play a decisive defensive role. They are very easy to hide and might go unnoticed as a weapon. As well, they are reliable, sturdy and can be used for various purposes. The data we’ve provided above can aid you choose the tactical pen for writing and self-dense at the same time. Most people carry a pen as they go to work or as they carry out different errands. So, why not have a pen that you can use for writing and at the same time as a defensive weapon? A tactical pen can come in handy when you are ambushed in the dark or if you need to open a can. That’s why you need a quality tactical pen that you can rely on in all situations. Tactical pens are usually constructed with heavy-duty metal, have pressurized ink cartridges, and fit easily in the pockets. With so many tactical pens on offer, we conducted research and came up with the best pens for defending yourself. Note that, not all brands that you see are as durable and reliable as they say they are. Here is our list of the best tactical pens on the market. Question: What is a tactical pen? Answer: Just like its name suggests, a tactical pen is similar to a normal pen as it can be used for writing but comes with additional features that allow it to be used as a tactical weapon. Unlike normal pen, tactical pens are made out of sturdy metals and other hard materials. The key function of the tactical pen is to act as a weapon for stubbing or hurting an attacker. But there are also some other tactical pens that come with extra features such as a lighter, can-opener, hatchet, scissor, etc. Question: Why should I carry a tactical pen? Answer: If you are new to tactical pens, then you should know that there is more to these pens than just writing. Apart from writing, tactical pens can as well be utilized for breaking glass, self-defense, for slashing and stabbing. You need to train yourself on how to use a tactical pen so that it can be an essential weapon in case you’re attacked in the dark. Teach yourself how to slash/swipe the knife, stab, and even how to utilize it as a knife to hurt your enemy. Question: What should I consider when buying a tactical pen? Answer: When most of us here about a tactical pen, we tend to think about it as a simple tool that can be chosen with much ease. This is not the case as a tactical pen is more than a pen. You need to identify several features that will help you defend yourself better if attacked. Things to consider include the material of construction, weight and size of the pen, size of the ink cartridge, self-defense features, grip, and lastly the price. All these factors play a crucial role in choosing the best tactical pen. Question: What are the best materials for a tactical pen? Answer: Tactical pens are made using a wide range of materials such as steel, aluminum, titanium, and different types of plastics. If I was to rank them from the strongest material to the weakest one, they could be in this order: titanium, steel, aluminum, and finally plastics. In most cases, a good number of tactical pens are created from a particular type of metal that is coated with another substance for added strength. Still, have a question after reading this best tactical pen? Comment below. Need More Help? Search Here…. We have more than 1,000+ articles.